I recently came upon a new clean and simple card challenge blog, CAS(E) this Sketch! I really like what I saw and knew that it would be a good place to start when the mojo just isn’t making an appearance or time isn’t available…or a little of both. So, when I sat down to create for my upcoming Sale-A-Bration workshop, I knew just where to go. This week’s sketch, CTS#12, is a beauty and allows for some creative wiggle room. I kept my interpretation of the sketch pretty exact, very clean and very simple, as I will be using this at my SAB workshop. 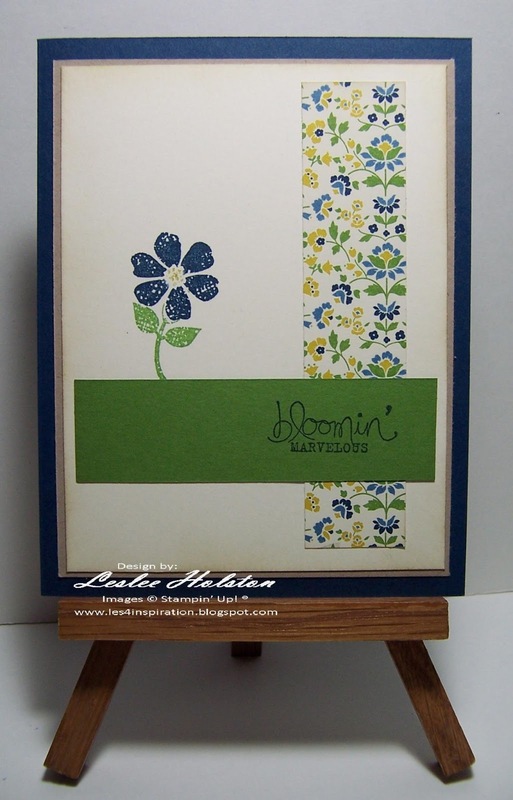 It features the SAB set, Bloomin’ Marvelous, and the Print Poetry DSP Stack that you can find in the Spring 2013 Catalog. The colors were picked right out of the DSP: Midnight Muse, Crumb Cake, Gumball Green, Summer Starfruit and Very Vanilla. Don’t you just love how beautifully they coordinate? I do! The flower was ‘built’ using the masking technique with the flower stamp and leaf stem stamp in the Bloomin’ Marvelous set (I just like saying “Bloomin’ Marvelous”). I’m submitting this card over on the CAS(E) this Sketch! site. I don’t get a chance to play along that often. Click on over and check out the other submissions for CTS#12 …they are all pretty ‘marvelous’! Thanks for stopping by today. I’m so glad you did :) I hope you’ve been inspired to CAS(E) this Sketch! too. perfect use of the sketch and that flower is so sweet. thanks so much for playing along with CAS(E) this Sketch! Love the tie in between the flower and the dp you chose - lovely fresh colours! Thanks so much for playing along with this week's CAS(E) This Sketch, Leslee!